Full spectrum garcinia from Swanson Premium Brands. Traditionally used to support weight management. Indian herb. Garcinia cambogia contains hydroxycitric acid (HCA), which can help support a healthy weight. Garcinia is a plant native to Asia, Australia, southern Africa and Polynesia. Its fruits have been eaten by local populations for centuries. It has also been used to give flavor to culinary dishes. Each capsule delivers 400 mg garcinia cambogia. Other ingredients: Rice flour, gelatin, may contain one or both of the following: magnesium stearate, silica. Suggested Use: As a dietary supplement, take one capsule one to two times per day with water. WARNING: Do not take this product if you are pregnant or nursing. 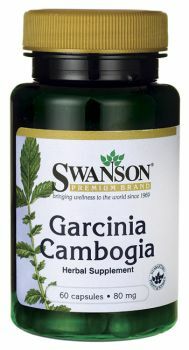 • Une gamme complète de Garcinia Cambogia par Swanson Premium Brands. • Traditionnellement utilisé pour maintenir des valeurs de poids normales. • Extrait de cette plante médicinale indienne magique 05:01.